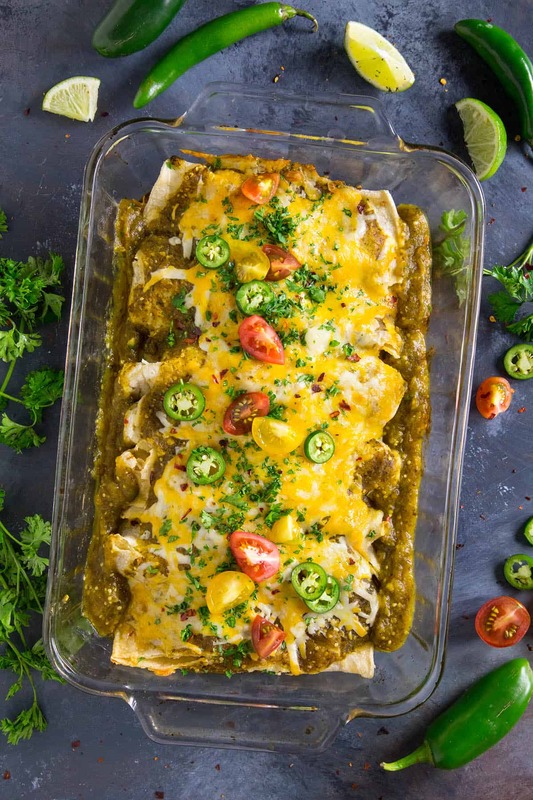 This recipe for chicken enchiladas verde is made with a classic homemade green enchilada sauce, tender, juicy pulled chicken, then smothered in melty cheese and baked to perfection. 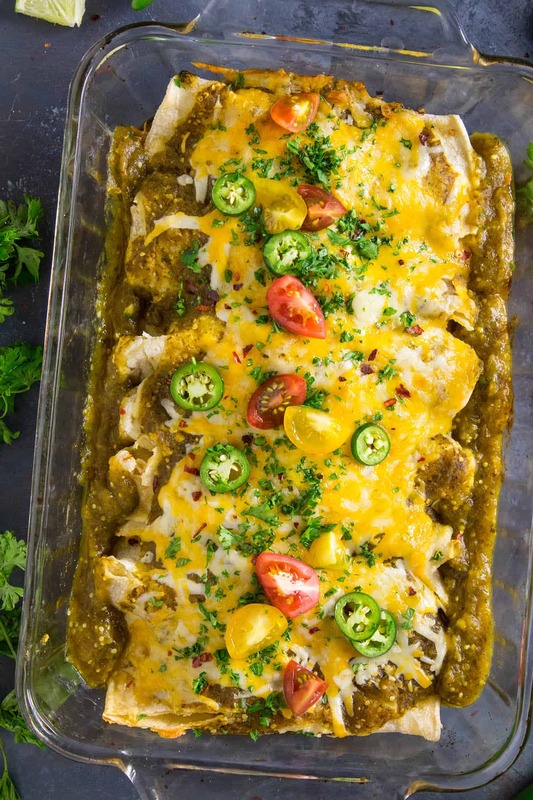 This is the best chicken enchiladas verde dish ever. Perfect for dinner and the leftovers are even better. Very recently I updated my post for the Homemade Green Enchilada Sauce Recipe to include a recipe video as well as more detailed steps in the cooking process. So NATURALLY I needed to use it. Right? It just makes sense! When you have yourself basically the absolute BEST green enchilada verde sauce on the planet in your possession, it is a moral imperative to go make yourself some enchiladas. Like these! We’re talking Chicken Enchiladas Verde with LOTS of cheese melted over the top, and you know what? These truly ROCK! 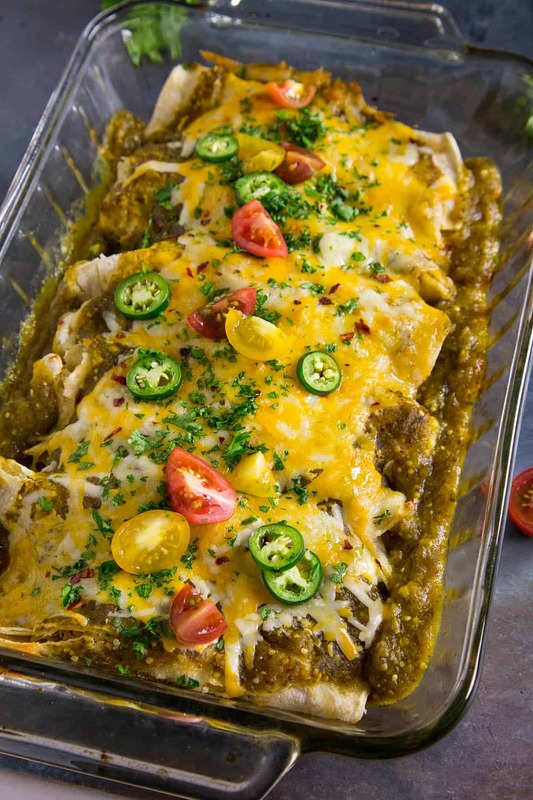 These enchiladas are cheesy and just slightly spicy and tangy from the homemade green enchilada sauce because I used a good amount of chili peppers as well as lime juice and tomatillos for one of the best flavor combinations known to man. Patty is IN LOVE with these enchiladas, so much so that she will occasionally threaten me if I don’t make them for her. So here we are! Making chicken enchiladas verdes! Let’s talk about how YOU can also make them at home, shall we? First, heat a small pan to medium heat and add the olive oil. Season your chicken with the blend of seasonings, then sear the chicken a couple minutes per side to let it brown up. Pour in the broth or beer and cover. Reduce the heat to low and let the chicken simmer about 30 minutes, or until it cooks through and becomes very tender. Remove the chicken from the heat and shred it with a fork. I set it into a separate bowl for this. 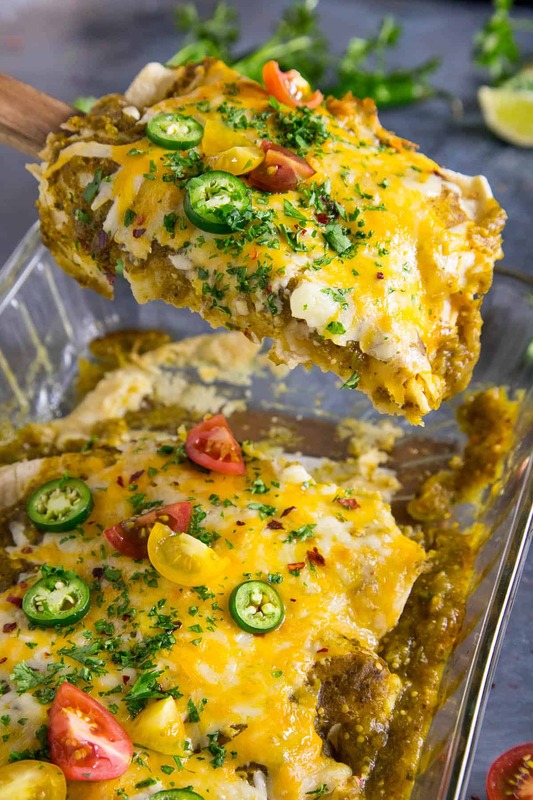 Spoon some of the green enchilada sauce onto the bottom of a 8×11 baking dish and spread it out, just enough to cover the bottom. Spoon the chicken into each of the corn tortillas and roll them up. Set them side by side in the dish onto the seams of the tortillas. They will all nestle up together. Pour on the rest of the green enchilada sauce, then top with cheese. You can easily add more cheese than I added, to your preference. 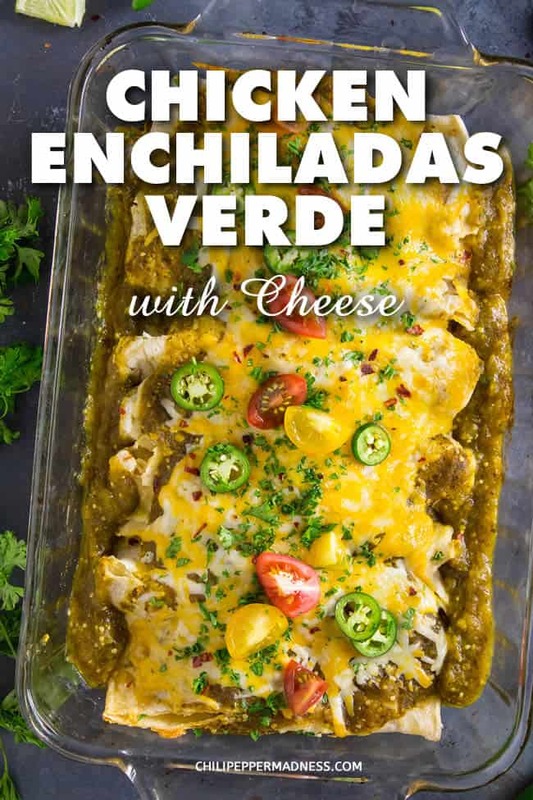 Bake the chicken enchiladas verdes for 20 minutes, or until the cheeses are nicely melted. Remove from heat and top with your favorite toppings. How Much Will This Serve? 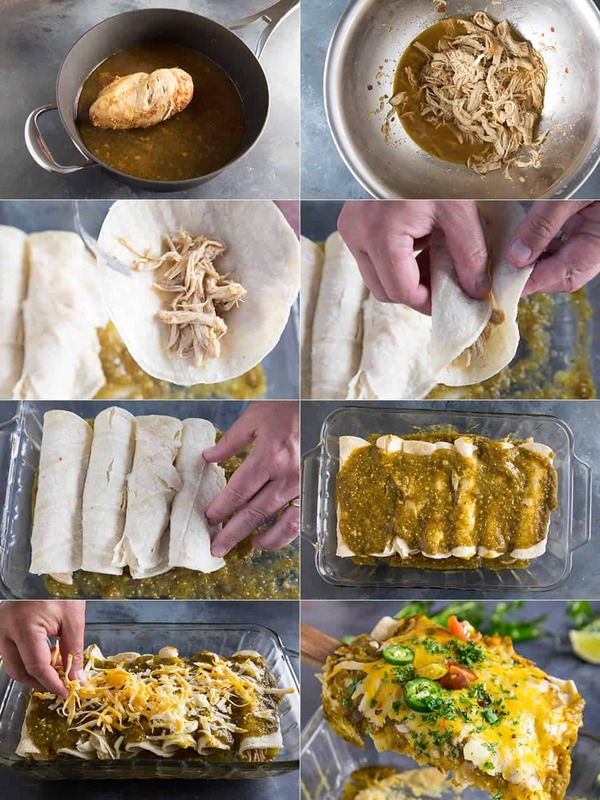 My chicken enchiladas verde recipe will serve 4-6 people very easily. If you’re super hungry, serve 4. Also, these are GREAT the next day. We’re only a 2 person household, so I can make this exact size recipe, enjoy it for dinner, then enjoy it again for lunch the next day. Use the microwave to warm the corn tortillas so they are more pliable, or warm them in the oven. Otherwise they might split when you try to fill them with the shredded chicken. If you’d like to save time, you can pan cook the chicken then chop it instead of waiting for it to become tender and shreddable. You can also use rotisserie chicken if you’d like, or leftover cooked chicken. As a variation, use tender shredded pork shoulder instead of chicken. It is SO GOOD! But so is this recipe. Like Mike said, I am IN LOVE with Enchiladas Verde. I could eat verde sauce every day. I just love the flavor of tomatillos and I really love this spiced up version. Whenever I have a chance I choose enchiladas at a Mexican restaurant. Now….if only I could figure out a way to convince Mike to make this more often!! Heat a small pan to medium heat and add the olive oil. Season the chicken with the blend of seasonings, then sear the chicken a couple minutes per side to let it brown up. Pour in the broth or beer and cover. Reduce the heat to low and let the chicken simmer about 30 minutes, or until it cooks through and becomes very tender. Remove from heat and shred it with a fork. Spoon some of the green enchilada sauce onto the bottom of a 8x11 baking dish and spread it out, just enough to cover the bottom. Pour on the rest of the green enchilada sauce, then top with cheese. Serves 4-6 Try this Homemade Green Enchilada Sauce Recipe. Heat Factor: Mild, though you can easily spice up this dish with additional spicy chili peppers or spicy chili flakes. Then I start frying the chicken once ready to turn, add the peppers & onion sear all until red pepper & onion just until crisp but firm but not over done. Let these cool out of the pan. Then I add a little cheese then asemble the tortilla. Assemble & bake as per Mikes recipe. I usually make enchiladas with scratch Red sauce but looks like I Will be trying this one soon. Thanks, Freddy. I hope you enjoy it. I need to get my scratch red sauce recipe online soon. I can’t wait to try this. I’ll have to make it a lower sodium version because of heart issues. Sure thing. I hope you enjoy it! Use fresh Hatch green chili peppers, if you can (pardon the pun). I buy them in season and roast them myself and they do freeze well. Put them in a blender and go to town with this recipe. A great recipe, but stay away from the canned stuff! Thanks, Donald. Yes, Hatch peppers would ROCK with this recipe. I have to order them frozen and have them delivered. But still very good! Gotta love the peppers and enchaladas. Oh now Im hungry! Have fun. Thanks. You had me at spicy…I love your blog and all of the delicious fun recipes to try. This recipe looks perfect for dinner. Thanks, Sandi. I love it for sure! Nice and spicy. I love a good enchilada recipe! This looks great! Love verde sauce. These enchiladas look wonderful. I’m saving to make sometime next week! Thanks, Nancy! Great stuff for sure! This looks like something my family would love! Thank you for incorporating such a great tutorial as well. It will make it so much easier to make! Thanks, Kathi! I hope they do love it!